One thing which has increasingly bugged me since I started researching EU financial integration is how repetitive the tropes of EU policy are. The goals, reasons, and benefits of integration seem exactly the same as they were in the 1980s when Jacques Delors’ 1st commission explicitly formulated them for the first time. The way in which EU financial integration policy proposals are framed reminds me of the movie Groundhog Day. In Groundhog Day, the story’s main character (played by Bill Murray) has to relive the same day indefinitely until he finds a way, through trial and error, to successfully seduce his object of affection. Similarly, every policy cycle of EU regulation seems to be an experiment to get financial integration working according to the blueprint set out in the mid 1980s. A new policy initiative is proposed, it seems to work for a while, a financial crash ensues and the cycle starts anew when slightly different policies are proposed to basically achieve exactly the same goals as before. Meanwhile, the stated policy goals become stale monotonously repeated tropes. For instance, the recent capital market union proposals are justified, in the 2015 Green paper (page 17), because the EU’s venture capital markets have too much fragmentation to enable a thriving startup scene. If we compare that to the 1999 Financial Services Action Plan, we read something remarkably similar (page 6): “discrepancies prevent risk-capital markets from acquiring sufficient critical-mass to represent a viable alternative to more costly and inflexible forms of financing for innovative start-up companies”. Some of these tropes go as far back as the 1966 Segré report. Nevertheless, the financial world had changed beyond recognition since the 1960s or 1980s, thus begging the question why the way the EU talks about it has remained so similar. This paper was largely written to investigate this intuitive feeling that EU financial integration policy was like a record put on indefinite repeat. How did this process of EU financial integration develop over the long term? To answer this crucial question for the Finance Europe project, comparing different epochs of financial integration in Europe became essential. However, I quickly found out that the European policy cycle is remarkably in sync with the academic cycle. Many social scientists do not really look beyond the specific conjuncture, often the current or the last, they seek to explain. Resultantly, there are many great monographs and works about specific European policy initiatives (cited in the paper), but very few that traverse policy cycles. Moreover, the literature seemed incredibly fragmented, with significant contributions in European Studies, Economic Sociology, Political Economy, History, and Geography. However, each of these disciplinary perspectives come with their own specific lenses and pet theories and are not necessarily cross-referencing each other. Thus, this paper essentially became about writing an overarching narrative about EU financial integration using a wide selection of existing literature as source. By collating all these studies produced in different disciplines, a more long-term perspective on EU financial integration comes in view. Moreover, as financial geography is the new disciplinary kid on the block studying this topic (although Leyshon and Thrift, for instance, were on this ball pretty early), I decided to emphasize the scattered contributions of financial geographers by seeking a distinctive financial geography approach to the subject. Many academics outside geography have a, for geographers, quite outdated view of what ‘space’ or ‘geography’ is (see Agnew or Lee for seminal arguments). It is often viewed as an absolute property, as absolute places on the map, or as a static relative category of distance. When such studies take ‘geography’ into account they often look at spatial variation as an explanatory variable. Geographers, however, do not limit themselves to variation ‘found’ in the world out there. Geographies and spatial variation are actively produced by agents and processes. Understanding how processes and agency shape spatial variation is the core of contemporary geographic thought. This ‘thick’ conception of space, ultimately going back to Henri Lefebvre, is at the heart of the analysis in this paper. How do spatial practices and institutions co-evolve with how people imagine the EU as a spatial category? The Groundhog Day analogy then becomes functional: as a recurring herding mechanism to establish a geography of an imagined European future that is slowly realizing itself. 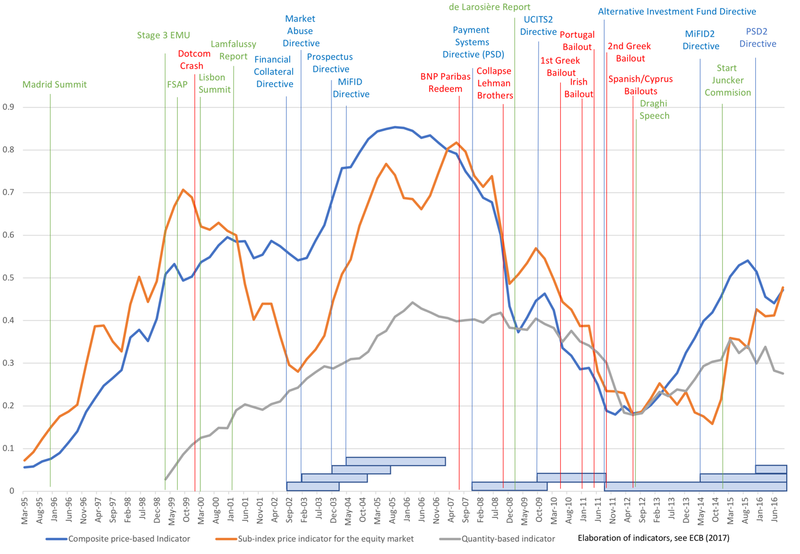 The horizontal lines show the different financial integration indicators while the vertical lines indicate major European events: directives (EU law) in blue, financial turmoil (in red) and other significant policy events (green). What is clear from this is the very cyclicality that fuels my Groundhog Day feeling: In boom times there are brash new policy proposals (emanating from the Madrid Summit, the Lisbon Summit, the start of the Juncker Presidency), but before the new policies are implemented a financial crisis ensues. Then the new directives become EU law in the post-crash period and they are accounted as post-crash reform resulting in policy makers start to make even more ambitious policies with the same goals. Of course, there is much nuance, and I invite you to read the actual working paper. The paper ends with a short reflection on current events: banking union and capital markets union that are enacted in the face of two developments, i.e., Brexit and the rise of fintech. It is an open, but fascinating question whether this conflation of current events will lead me to write an identical blogpost to this one in ten years or whether the EU is on the verge of fundamentally changing in character. I hope this paper will encourage the community of financial geographers to find out. Read more in the Financial Geography Working Paper #15.